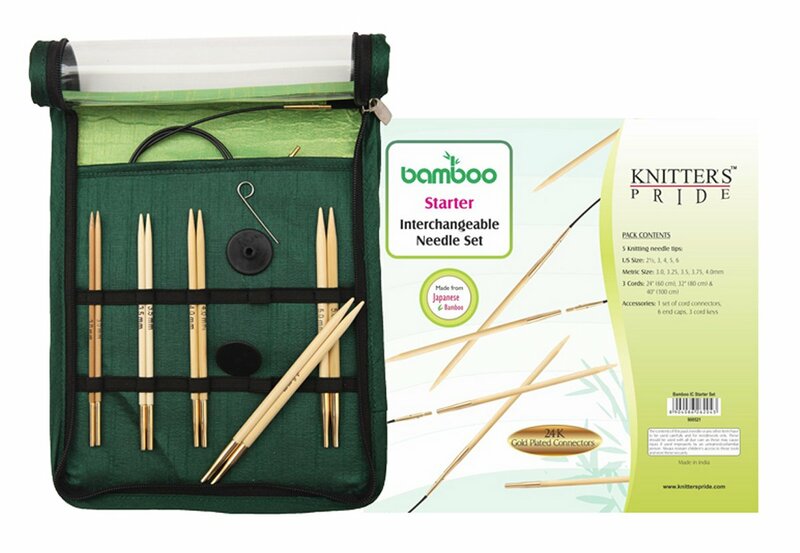 These interchangeable needle tip sets from Knitter's Pride are manufactured using high-quality Japanese bamboo and the connectors are plated with 24 Karat gold! 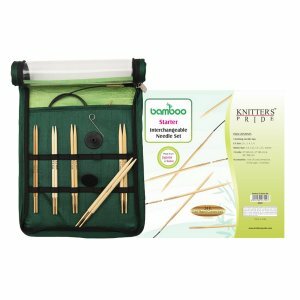 Lightweight, yet strong and durable, these tips feature perfectly tapered points with a smooth finish for hours of enjoyable knitting! The DELUXE set contains 10 needle tip pairs in the following sizes: US 2.5, 3, 4, 5, 6, 7, 8, 9, 10, 10.5, 10.75, 11 / Metric 3.0, 3.25, 3.5, 3.75, 4.0, 4.5, 5.0, 5.5, 6.0, 6.5, 7.0, 8.0. Also included are 4 cords (to make 24", 40" & 2 of 32"), 1 set of cord connectors, 8 end caps and 4 cord keys, all packaged in a green fabric case with a see-through front flap. The STARTER set contains 5 needle tip pairs in the following sizes: US 2.5, 3, 4, 5, 6 / Metric 3.0, 3.25, 3.5, 3.75, 4.0mm. Also included are 3 cords (to make 24", 32" & 40"), 1 set of cord connectors, 6 end caps and 3 cord keys, all packaged in a green fabric case with a see-through front flap. The CHUNKY set contains 5 needle tip pairs in the following sizes: US 10, 10.5, 11, 13, 15 / Metric 6.0, 6.5, 8.0, 9.0, 10.0mm. Also included are 3 cords (to make 24", 32" & 40"), 1 set of cord connectors, 6 end caps and 3 cord keys, all packaged in a green fabric case with a see-through front flap.